Khloe Kardashian is showing off her love of cookies. The Keeping Up with the Kardashians star recently took to her Instagram account to share a few photos — and a video — of herself enjoying one of her favorite sweet treats, Oreo cookies. On Friday, December 28, Khloe Kardashian took to her Instagram account to share photos of herself munching on some Oreo cookies in her kitchen. As many fans know, Khloe usually has stacks of cookies piled up in large glass containers in her kitchen. Although Kardashian doesn’t like to eat much of the cookies herself, she will, at times, indulge in the treat. In the photo, Khloe decided to do just that. The reality star is seen biting the chocolate cookie and smiling. In another photo, Kardashian poses next to her perfectly stacked stash of cookies. In a third snapshot, she reaches her hand in the cookie jar to grab one of the sugary delights. Khloe also posted a video of herself biting into a cookie, smiling as flashes from cameras are seen around her. Kardashian is seen wearing some black pajamas with white trim in the photos, and has her long blonde hair parted down the middle. Her tresses are styled in loose waves which cascade about her shoulders and back. She also sports a full face of makeup in the images. However, it looks like Khloe took a bit of time off from eating salad to enjoy an Oreo cookie. As previously reported by the Inquisitr, Khloe recently revealed that she does something very important with her baby daughter, True Thompson. The reality star says that she and True do daily affirmations in the mirror to start their day. “She’s only a few months old, but we stand in the mirror, and I say something to her reflection, and I pretend she’s saying it back to herself,” Khloe revealed, seemingly hinting that she hopes to build her little girl’s confidence as she continues to get older. Affirmations are supportive statements that are often used to build confidence, to help one reach their goals. Common goals include improvements in the realm of health or fitness. Fans can see more of Khloe Kardashian via Instagram, or when Keeping Up with the Kardashians returns for a new season in 2019. 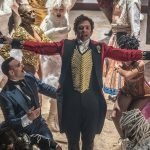 Greatest Showman: Reimagined release date: When is album coming out?